Plug-in Alarm and Keyless Entry System Generation IV built for your pre-wired BMW E36 & M3 3-Series (1992-1999). Security Alarm – Protects your BMW from break-ins and tampering. 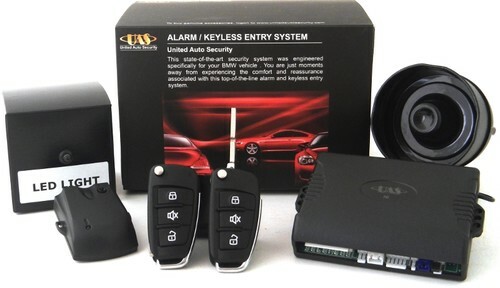 Remote Keyless Entry – Lock and unlock doors and trunk by remote. Detailed Installation CD Manual with Plug-n-Play Harness – Easy DIY installation. Heavy Duty Flip Key Remotes – Keys will need to be cut at a locksmith to match your original key. On BMW’s built 1995+ you will also need to transfer the transponder chip to your new keys OR have your EWS programmed to add new keys from United Auto Security. 2 Remote Auxiliary Outputs – You can add other accessories. Parking Light Flash – Flashes the parking lights to confirm that the car is locked. 2 Flip key remotes with BMW key blanks. This is an aftermarket system built for your BMW vehicle. United Auto Security is not affiliated with BMW.